At Readapted we design and build custom furniture, commercial millwork and landscape site furnishings focused on the use of environmentally friendly materials and methods. Located on an organic farm among the rolling hills of Southwest Wisconsin, the shop-studio is constructed from a range of re-purposed materials including used shipping containers, doors, windows, interior walls and more. Wood scraps provide the majority of our heating needs. We make good use of the local hardwoods like walnut, oak, cherry & maple, by having logs sawn and then dried in our solar powered kiln. We never forget our place in the environment and the responsibility to help preserve it. Salvaged urban trees were used to create this large 60 x 108 dining table. The base was fashioned from salvaged antique cast iron railing posts along with some new metal materials. Using solid quarter sawn white oak and veneer, this flowing form fits nicely in the high rise condo. A small drawer offers space for a few items making a tidy work space. The spruce wood for the head board and platform were from a tree that needed to be removed for the renovations on this Wisconsin farm house. The logs were cut and dried, then combined with local walnut to create this piece. The design was influenced by 'Hoosier Cabinets' common in kitchen of the early 20th century. Solid black locust wood and an oil finish adds a warmth to the space. Part office and part guest room, this design provides functionality and contemporary style to the urban space. Stainless steel roll up doors offer storgae for the printer and supplies, cables are covered with a stainless shroud. Chicago's favorite taco/whiskey spot added this outdoor seating area for take out. Made from black locust these site furnishings will provide years of service. 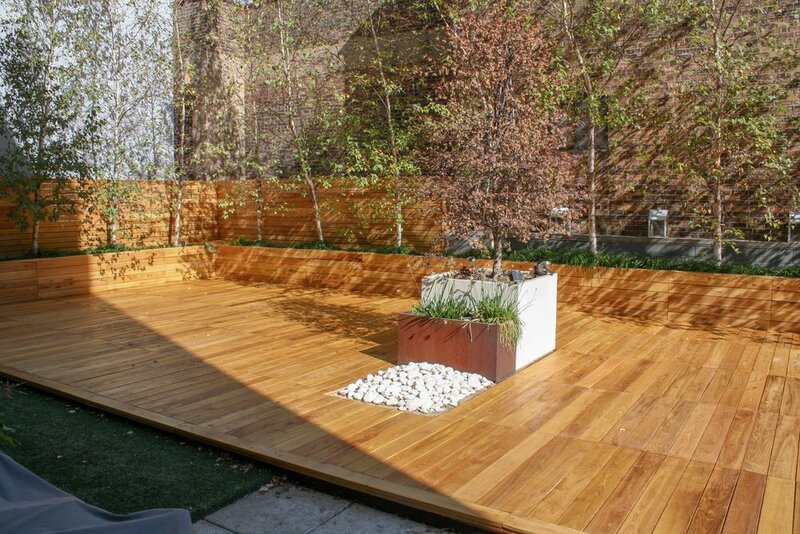 Black locust was used to remake this residential roof garden. Deck panles, planter fronts and fence sections were all replaced. Made from recycled HDPE -think milk jugs - these containers have clean lines and can be made custom and site specific. Our unique design eliminates the need for foam insulation, adding to the environmental benefits of the exterior material. The surface has a slight texture, is food safe, recyclable, durable, won't mold or stain and an architectural grade material. In 9 colors.